When it comes to heroines in the Dragon Ball franchise, most of the ladies usually sit on the sidelines and let the main heroes take the big bad down. The exception is Android 18. Android 18 is arguably a complex character, and one of the very few female characters who makes a strong impression on the viewers from her very first appearance. No fan can forget about when 18 destroyed Vegeta in her first battle, or when her future-self nearly destroyed Gohan and the entire world were it not for Krillin. She was a former-villain-turned-hero in the Cell Saga arc and quickly became a fan favorite in the fandom. Android 18 is not your typical Android in the series. She’s arguably one of Dr. Gero’s strongest creations, with Power Levels that exceed those of a regular Saiyan. Strength isn't the only thing she has, though. She's a mother and a seasoned Z Fighter with powers destructive enough to beat Goku's toughest enemies. There are many secrets about Android 18 that fans of the franchise or casual anime viewers probably might have missed. We know that she’s technically a cyborg and that she broke both of Vegeta’s arms, but there’s more behind the mysterious 18, and we’re here to share them. Here are the 16 Things You Never Knew About Dragon Ball's Android 18. 16 Her Power Level Is Over 9,000! Dragon Ball Z: The Anime Adventure Game stated that Android 18's power level is 30,000,0000. The Anime Adventure Game is a pen and paper RPG that features the Dragon Ball characters in the series. The game provides logistics on how powerful each character is. For example, Krillin can defeat Superman with his pinky, and Goku's Power Level was at 1.2 million at the end of Frieza Saga. Android 18 has a large supply of ki energy. After all, Dr. Gero programmed her to kill Goku, so she was programmed to have the highest ki levels in the Dragon Ball universe. In fact, most of the androids have a high amount of ki. Power Level measures the ki output of a user, and with enough energy, an individual can unleash extremely powerful attacks. If we went by Power Levels alone, then Android 18 can decimate every opponent. Android 18, 17, 13, and 20 are the only ones in the android series who were once humans. Android 17 and 18 were once part of a notorious gang before Dr. Gero kidnapped them in order to conduct robot experiments. Not much is known about her past aside from what is seen in the manga and anime, but we do know that the transformation didn't change her appearance. Instead, the altercations were done on the cellular level, and most of the artificial enhancements were organic, which makes her and her twin brother cyborgs. The organic material consists of cell enhancements, which would grant the two the ability to learn new moves. She and 17 can therefore train to learn new moves. This also explains why she was able to learn Krillin’s signature attack. Android 18 and 17 learned more about their infinite energy supply during the Tournament of Power. Android 18 discovered that she has infinite stamina, so opponents are unable to wear her down. In fact, trying to wear her down would be one of the worst strategies to use against her. Android 18’s infinite power supply and stamina make her a worthy opponent. She can outperform a Saiyan and can defeat opponents that even Saiyans have trouble battling. Goku could barely lift Tupper up in midair, but 18 was able to do this with ease. Her only weakness is that she sometimes underestimates opponents, such as Goku. The same goes for Vegeta. If 18 devoted her time, trained with the rest of Z Fighters, and mastered different techniques from her fellow team members, she could easily win against each of them. However, her brother, 17 is the strongest of the two because his power isn’t suppressed-- unlike 18. This is both a convenient plot point for GT, which allows 17 to defeat 18, as well as a missed opportunity to showcase 18’s other powerful attacks. In the Dragon Ball series, no one actually dies. 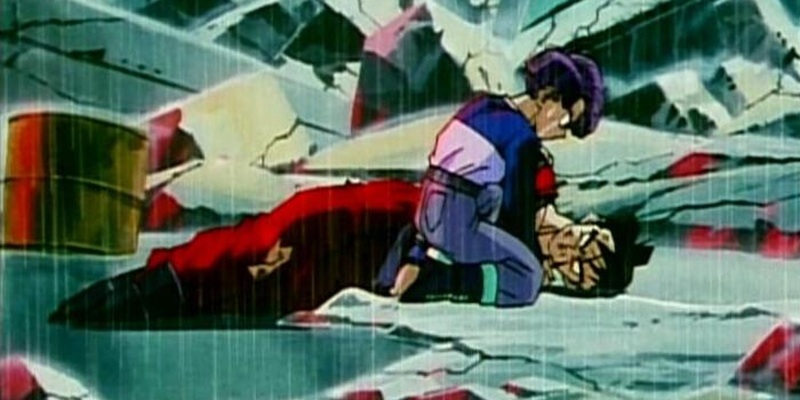 Android 18 died twice in the series but eventually gets resurrected in the end. In the Fusion Saga, Super Buu turns her and her friends into chocolate and then eats them. The other time that 18 died was when Frieza destroyed Earth along with its inhabitants in Dragon Ball Z: Resurrection F. During both occasions, she and her friends ultimately get resurrected because of the Dragon Ball wish that was used to revive people at the last minute. In the case of Frieza, Whis used his Temporal-Do-Over technique to undo the time that Frieza destroyed the war. After Super Buu’s defeat, Porunga wished that everyone was still alive, which brought everyone (including Master Roshi) back from the dead. Although it’s not overly explicit, Android 18 is the only female member of Team Universe. She joined Goku’s team in the Tournament of Power as one of the Universe 7 members. By now, 18 is already a mother to Marron and a wife to Krillin. She and Krillin entered the tournament because of the prize money, but she suspects that there was more to Goku’s invitation than the prize money. While she’s the only female member of the Z Fighters, 18 can easily defeat most Saiyans. Ultiamtely, 18 has no problem defeating her opponents in the tournament. She’s strong enough to beat a Saiyan and even Mr. Satan, the former 24th Champion, in the 25th World Champion Tournament. So it’s no surprise that 18 sends Tupper flying-- something Goku couldn’t have done-- matched evenly with Cocotte, and beat Shosa with Krillin’s help. Android 18 even extended her strength to help her brother Android 17 when 17 was having a hard time battling Santa Ku. To be fair, Accel Dance in the anime is only used by Future Android 18 and 17, whereas the present Androids never actually use it in the series. In Future Trunks Saga, Future 18 and 17 use this Accel Dance to kill Future Gohan. The signature attack combines 18 and 17’s moves to overwhelm their opponent. The dance depends on who leads the attack. If it’s 17, then they will unleash 17’s Dead End Bullet and 18’s Dead End Rain on the person. If it’s 18 who leads, then the dance is slightly altered, where 18 delivers the final kick blow to their enemy. Future 17 and 18 use both their Dead End attacks and 18’s signature kick to overwhelm Future Gohan. Accel Dance received its name from the video games, and depending on the partner, Krillin can replace 17 and create the Accel Dance with Android 18. Fans may remember when Android 18 curb stomped Vegeta after she and 17 killed Dr. Gero. However, most fans probably forgot that she actually broke both of Vegeta's arms. The Cell Saga introduced the androids, designed by Red Army's mad scientist Dr. Gero, and built with one purpose: to kill Goku. Android 18 and 17's debut shocked viewers-- they murdered their creator and followed 16's path to destroy Goku. Or, at least, this was the original plan... until Vegeta challenged the androids. Android 18 then broke Vegeta’s arms with her signature attack: Sadistic 18. Her roundhouse kick delivered a devastating blow, and in a way, also broke Vegeta's pride. The fight was memorable in a lot of ways. Android 18 and 17's chilling debut changed the game, proving to views that the Saiyans are ultimately mortal. Furthermore, 18 also squashed Vegeta’s pride, forcing him to train harder than ever before. From the Saiyans' perspective, the previous androids were a cakewalk, but 18 and 17 posed a far greater threat. Fans would expect that Android 18 would be hydrophobic given that she’s part mechanical. However, this is not the case. When Dr. Gero restructured 18 and 17, their base components were made with organic material, which makes the two not entirely android. Bulma recovered the blueprints of 18 and 17 from Dr. Gero, which proves this theory. Only the detonator inside of them is mechanical, whereas other androids have mechanical limbs. Hence, 18 is able to take bath and showers without having to worry about short-circuit problems. It’s likely that Dr. Gero made the two androids water resistant given that a) he’s a mad scientist-genius, and b) it would be practical that his creations could handle water given the fact that they’ll be fighting on Earth. Sixty-percent of the planet’s surface is water, after all. In the video games, the androids can fight on water-based battlefields. Akira Toriyama never intended to write Android 18 and Krillin as a couple. In fact, 18 and 17 were never part of the Cell Saga until an editor told Toriyama to change the storyline and make the arc more interesting. These changes thus created Krillin and 18's relationship. Android 18 first flirted with Krillin with a goodbye kiss, not knowing that Krillin would actually help her later in the series. Although their relationship serves as a subplot in the Perfect Cell arc, it also provides Krillin's motivation to stop Cell's completion. The fact that Krillin wished for 18 and 17 to return back as humans sealed the deal for her. The two married after Cell was defeated, and eventually, they both had a cute daughter named Marron. Even Future Trunks was shocked to learn that Present 18 and Krillin had started a family. Android 18’s real name is Lazuli in conjunction with her twin brother’s real name, Lapis. If placed together, Lapis Lazuli is a blue metamorphic rock, which is regarded as semi-precious due to its antiquity. It is used to craft expensive artisan goods. In the Middle Ages, wealthy patrons used the stone to create ultramarine-- a fine, blue color pigment used by painters and textile factories. Android 18 never goes by her real name, however. This is most likely due to the fact that it reminds her of Dr. Gero and her delinquent days right before she and her brother were taken away. In the anime, there are a few times when people ask her about her real name. In the tournament arc, 18 told the referee to address her as 18, despite the fact that it was Dr. Gero who had originally assigned her this number. Most of the Z team members refer to her as 18, even Krillin. Meredith McCoy voices Android 18 in the Dragon Ball franchise. The anime series recorded character songs-- this is similar to how Japan's voice actors often sing character songs for the character in the show. The song, titled “Android 18”, is one of the more obscure songs, and sounds like a cross between Stranger Things' and Blade Runner's soundtracks. McCoy performed the vocals of the song while Bruce Faulconer did the music composition. Some of the lyrics fit with 18’s complex persona, such as: “I'm your angel your desire. I'm your vision you cant escape. I'm your rival your mistake.” McCoy is an established singer and has collaborated with other bands like Vince Vance & the Valiants, a classic rock and country group, and Cary Richard’s Orchestra. Android 18 wasn’t only given a theme song, though. Chance the Rapper references the android in his single “Blessing”-- the rapper laughs when Kuririn mentions blonde hair. Marron, the daughter of Android 18 and Krillin, acts as the main moral support throughout the tournament arcs. Marron’s name is the French word for "chestnut," and is a nod to Krillin, whose is also named after a chestnut. In katakana, Krillin's charcter is called Kuririn. Kuririn has the word "kuri" in it, which is the Japanese word for chestnut. Marron looks like her father at a young age, but she takes her mother's appearance later on. Although Dr. Gero altered Android 18's anatomy, Gero didn’t take away 18’s reproductive organs, which allows her to have children. The same goes for Android 17. Marron didn’t inherit Krillin and 18’s powers, however. So far she is the only normal human out of Z Fighters’ children, but a few poacher enemies on the island sensed there was a strong power in her and stayed away from her. Android 18 is not a fan of Chi-Chi’s Chinese dresses. During a raid at Goku’s home, 18 stumbled upon some of Chi-Chi’s dresses and decides to try them, concluding that they're ugly. When it comes to fashion, 18 regularly shops and she buys new clothes for Martin whenever they participate in the world tournament. The only person who tolerates Chi-Chi’s Chinese dresses is Future Android 18. Only a villain would appreciate things that the good version would dislike. Future Android 18 thought that the Chinese dresses were cute and didn’t see them the way her present-self did. Both of them have very different fashion tastes. There was one time when Android tried on a cowgirl outfit, which 18 wore out of the store without paying. The store owner called the police on them, but the sheriffs were quickly defeated by her. YouTube channel DEATH BATTLE! brought another Dragon Ball character into their series--- Android 18, who was up against Captain Marvel. DEATH BATTLE! is a popular web series that pits two fictional characters-- mainly pop culture characters, from different shows, shows, and comics--- together in Battle Royale fashion. "Wizard" (Ben Singer) and "Broomstick" (Chad James) act as commentators and analyze the respective characters' move sets to determine who the ultimate victor is. In 18's battle, Wizard and Broomstick analyzed her ki powers, stamina, and actually calculated just how powerful she is. Her speed is over 300,000 mph. She is the fifth Dragon Ball character to appear in DEATH BATTLE! and is the first female Dragon Ball character who has appeared in the web series. She is also the first Z Fighter to win against a superhero. Since both can absorb energy, it was a matter of endurance, which 18 excelled at. Goku has competed against Superman, but even he couldn't defeat the Man of Steel. Not only did Android 18 marry Krillin, but she also mastered his signature move: Destructo Disc, a powerful golden ki attack that can slice through anything. Krillin taught her his signature move, and 18 used Destructo Disc against Might Mask in the 25th World Tournament. In the games, 18 and Krillin can merge their powers and unleash are more powerful Destructo Disc on an opponent. Krillin's signature technique is strong. Other Z Fighters, as well as their enemies, are able to recreate it with a few additional techniques. Each warrior's ki determines the disc's size and power level. Vegeta, Goku, and 18's disc techniques are similar to Krillin's, whereas Perfect Cell managed to create two Destructo Discs in one sitting. Frieza improved the technique and called his version "Death Saucer." A big misconception among fans is that Android 18 isn’t an android. The same goes for her twin brother, 17. She is called an android because she’s part Dr. Gero's experiments and was "created" by him. In reality, she should be called Cyborg 18 because she’s a cybernetically enhanced being with a human base. Androids, by default, are artificially enhanced robots with some degree of AI awareness. Cyborgs in Dragon Ball would thus be similar to the cyborg enhancements in Ghost in the Shell. Cyborgs are superior to the average human, but because of their human base, are considered to be more human than robot. Android 18 is thus both artificially enhanced and a human at the same time. However, 18 doesn’t mind being called an android, and gradually accepted the name since she can never become a regular human being again. Can you think of any other interesting facts about Dragon Ball's Android 18? Let us know in the comment section!